July, 1955. Donald Langham has interrupted his romantic break in rural Suffolk with the delectable Maria Dupré to assist a fellow writer. 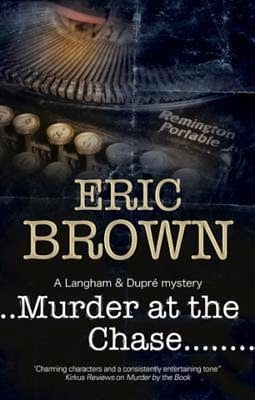 Alastair Endicott has requested Langham's help in discovering what's happened to his father, Edward, who seems to have disappeared without trace from inside his locked study. Before he vanished, the elder Endicott had been researching a book on the notorious Satanist Vivian Stafford. Could the proposed biography have something to do with his disappearance? Does local resident Stafford really possess supernatural powers, as some believe? As Langham and Dupré question those around them, it becomes clear that there have been strange goings-on in the sleepy village of Humble Barton. But is the village really haunted – or does someone merely want it to look that way? With a further shocking discovery, the case takes a disturbing new twist. Donald Langham, mystery-thriller writer, and Maria Dupré, literary agent, are recuperating from the emotional trauma and physical wounds from their last encounter with a blackmailer (Murder by the Book). They are also in an established romantic relationship and looking forward to spending some time together in the country away from the hustle and bustle of the city. Unfortunately, their weekend in the country quickly becomes a hunt for a missing person, an investigation into a purported centenarian occultist, and more. All the while Donald is looking for the perfect opportunity to propose to Maria as Maria obsesses over whether or not he's actually interested in a permanent relationship. Will murder and mayhem keep these two off-balance? Can they ascertain the truth about the Satanist and the village's hauntings?